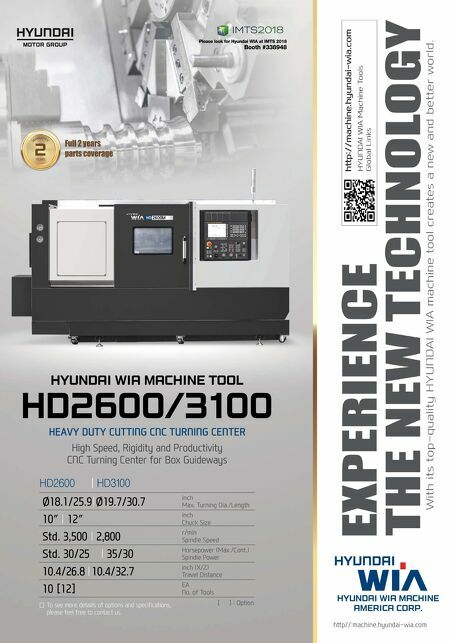 MMS JULY 2018 66 mmsonline.com CUTTING TOOLS Machine and Engineering's new AccuThread T3 line of thread mills was designed specifically for these applications. She explains that during tapping operations, the tap is completely engaged with the workpiece, which results in a good bit of heat generation because the tap's cutting edges do not get a chance to cool down and coolant has a tough time reach- ing them. This is particularly problematic when tapping high-temperature alloys, commonly used for aerospace and oil/gas applications, because those materials resist heat rather than absorb it. As a result, all the heat generated during tapping is directed into the tap. This, combined with the high tool pressure resulting from multiple teeth being engaged with the material, can cause the tap to wear prematurely or even break off in the hole. The latter scenario might require time-con- suming rework or cause the workpiece to be scrapped, which can be costly given that threading is typically one of the final machining operations performed on a part. These considerations make thread milling more attractive to some shops, especially those threading expensive workpiece materials, even though thread mills are more expensive than taps. That said, it can be challenging to machine threads in high-temperature and hardened mate- rials using conventional thread-milling tools that machine a complete thread in one 360-degree helical movement (for example, a thread mill that has a sufficient number of cutting edges to mill the entire thread profile into a 0.75-inch-deep hole in one helical rotation). The high cutting pressure generated because all cutting edges are simultaneously engaged with the material can cause tool def lection and poor thread finish. Conversely, the AccuThread T3 solid carbide thread mill with proprietary, multi-layer AM210 PVD coating cuts essentially one thread at a time in a continuous helical motion into a hole, which minimizes tool pressure and the risk of deflection. Although these tools have three teeth, the first per- forms the bulk of the thread-cutting action and the other two essentially clean the threads it creates. Therefore, there is little cutting pressure on the tool, so deflection typically is not problematic. In addition, the cutting edges have a chance to cool, because they are not constantly in the cut and it is easier for flood coolant to reach them. 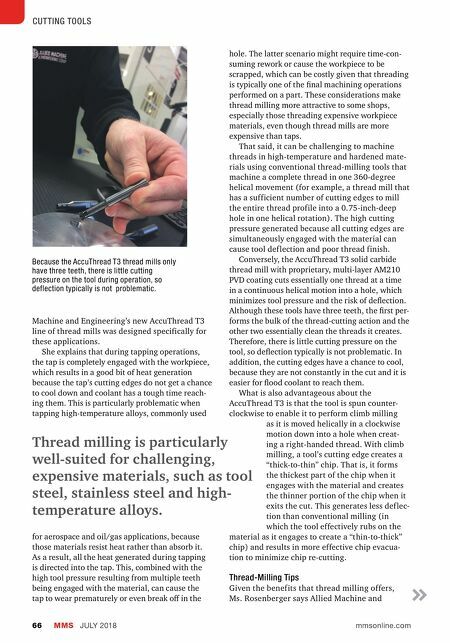 What is also advantageous about the AccuThread T3 is that the tool is spun counter- clockwise to enable it to perform climb milling as it is moved helically in a clockwise motion down into a hole when creat- ing a right-handed thread. With climb milling, a tool's cutting edge creates a "thick-to-thin" chip. That is, it forms the thickest part of the chip when it engages with the material and creates the thinner portion of the chip when it exits the cut. This generates less def lec- tion than conventional milling (in which the tool effectively rubs on the material as it engages to create a "thin-to-thick" chip) and results in more effective chip evacua- tion to minimize chip re-cutting. Thread-Milling Tips Given the benefits that thread milling offers, Ms. Rosenberger says Allied Machine and Thread milling is particularly well-suited for challenging, expensive materials, such as tool steel, stainless steel and high- temperature alloys. Because the AccuThread T3 thread mills only have three teeth, there is little cutting pressure on the tool during operation, so deflection typically is not problematic.